Your users can now deposit and withdraw Bitcoins. You set the fees that your users pay to you when they transact or withdraw coins. Easily interface to other cryptocurrencies besides Bitcoin. Simply install the provided altcoin adapters for the currency you require. Users can transfer coins to other users. Present a simple, knockout.js-enabled frontend UI using shortcodes or widgets. Or roll your own. Users are notified by email whenever they perform transactions. Configure messages via the admin interface, or bind to WordPress actions and code your own notification functions in PHP. Enable or disable user actions via WordPress capabilities. All accounting data is stored safely and efficiently in your database. Export accounting data to .CSV backup files with one click. Import again with ease. 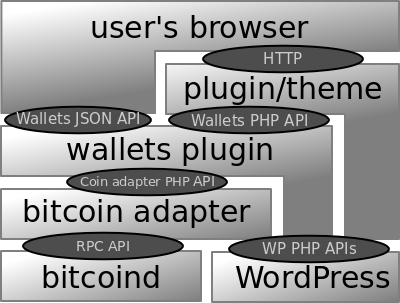 PHP and JSON APIs give access to the wallets from your theme or other plugins. Look out for more apps that build on this awesome APIs in the near future, or create your own! PDF Documentation explains the ins and outs of this plugin in detail. Full PHPdoc is included for the PHP API. Also available on steemit. Protection against common plugin security vulnerabilities such as CSRF attacks and SQL injections. Easily secure funds in Cold Storage wallets. The modular philosophy of the Bitcoin and Altcoin Wallets plugin is about providing programmatic access to an abstraction layer that can then talk to a bitcoin wallet or to other cryptocurrencies. In simple English: You and others can build and use applications that do financial transactions, without worrying about the implementation details of each coin, or about UI issues, accounting, etc. Install this plugin and configure the settings to use your wallet’s RPC API. Insert the simple shortcodes into your site’s content. Can I see the software stack diagram? If you are connecting to an RPC API on a different machine than that of your WordPress server over an untrusted network, make sure to tunnel your connection via ssh or stunnel. See more here. By continuing to use the Bitcoin and Altcoin Wallets plugin, you indicate that you have understood and agreed to this disclaimer. Download this FREE plugin here, or install from WordPress.org! Make sure to download the bundle to get the documentation too! Make sure to review the Installation instructions, because you will have to connect the plugin to a Bitcoin wallet, an altcoin wallet, or a web wallet. An up-to-date PDF is always included with the bundle download of the plugin. Alternatively, you can browse the documentation on steemit. Updated on 2018-08-22T08:54:37+00:00, by alexg.